John 3:16 (AMP) For God so [greatly] loved and dearly prized the world, that He [even] gave His[One and] only begotten Son, so that whoever believes and trusts in Him [as Savior] shall not perish, but have eternal life. John 3:16 (NASB) For God so loved the world, that He gave His only begotten Son, that whoever believes in Him shall not perish, but have eternal life. Yohanes 3:16 (AVB) Allah begitu mengasihi dunia sehingga menganugerahkan Anak-Nya yang tunggal supaya setiap orang yang percaya kepada-Nya tidak binasa melainkan mendapat hidup kekal. John 3:16 (NABRE) For God so loved the world that He gave His only Son, so that everyone who believes in Him might not perish but might have eternal life. John 3:16 (NIV) For God so loved the world that he gave his one and only Son, that whoever believes in him shall not perish but have eternal life. 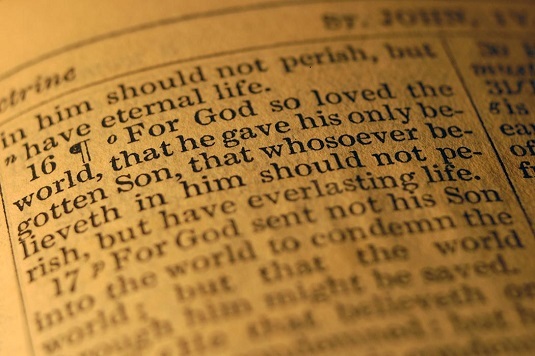 John 3:16 (NLT) For this is how God loved the world: He gave his one and only Son, so that everyone who believes in him will not perish but have eternal life. John 3:16 (NRSV) For God so loved the world that he gave his only Son, so that everyone who believes in him may not perish but may have eternal life. John 3:16 (GNT) For God loved the world so much that he gave his only Son, so that everyone who believes in him may not die but have eternal life. John 3:16 (MSG) This is how much God loved the world: He gave his Son, his one and only Son. And this is why: so that no one need be destroyed; by believing in him, anyone can have a whole and lasting life. God didn’t go to all the trouble of sending his Son merely to point an accusing finger, telling the world how bad it was. He came to help, to put the world right again. Anyone who trusts in him is acquitted; anyone who refuses to trust him has long since been under the death sentence without knowing it. And why? Because of that person’s failure to believe in the one-of-a-kind Son of God when introduced to him. John 3:16 (NIrV) God so loved the world that he gave his one and only Son. Anyone who believes in him will not die but will have eternal life. John 3:16 (TLB) For God loved the world so much that he gave his only Son so that anyone who believes in him shall not perish but have eternal life. Yohanes 3:16 (ABB) Allah sangat mengasihi orang di dunia ini sehingga Dia memberikan Anak-Nya yang tunggal, supaya setiap orang yang percaya kepada Anak itu tidak binasa tetapi beroleh hidup sejati dan kekal.